It was a day when AFC Rushden & Diamonds needed to get back to winning ways and by the end of the afternoon, it was a case of job done. 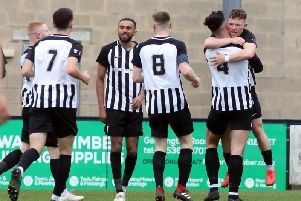 All the goals came in the first half at Hayden Road as Diamonds came from behind to secure a 2-1 victory over Needham Market to keep themselves right in the fascinating jostle for the play-off places in the Evo-Stik League South Premier Division Central. Like everywhere else across the country, the elements more than played their part as a gale-force wind swept across the ground throughout the whole 90 minutes. And, despite the best efforts of both teams, this ended up being one of those games that won’t live long in the memory when it comes to entertainment value. But, at this time of year, entertainment can take a back seat. If you’re fortunate to have something to play for, results are all that matter and this was a big win for Andy Peaks’ side. They came into it without a victory from their last three matches and while no panic button was ever going to be hit, Diamonds really needed to hit back to ensure they stayed in the hunt for a top-five finish. But they had to do it the hard way. In fairness, the two teams defied the dreadful conditions to serve up a very watchable first half. Diamonds went close when a driving run and cross from the highly-impressive Sam Johnson had no takers but the ball was retrieved by Declan Rogers who set up Jack Westbrook and his well-struck shot fizzed just over the bar. But it was the visitors who opened the scoring on 19 minutes - and what a goal it was. Westbrook lost possession in his own half and the dangerous Joseph Marsden had his run ended by a challenge from Ben Farrell 25 yards from goal. And Jamie Griffiths stepped up to curl an unstoppable free-kick into the top corner with Diamonds goalkeeper Ben Heath left helpless. However, Diamonds didn’t take long to muster up a response. 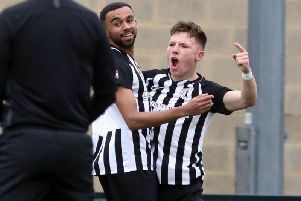 Just three minutes later, Sam Brown launched a trademark long throw into the Needham penalty area, Alex Collard flicked it on and it eventually landed at the feet of Declan Rogers who made no mistake with a firm finish. Farrell was denied by Jake Jessup soon after and Diamonds continued to look the more threatening before the they took the lead four minutes before the break. Heath sent a free-kick deep into the Needham half, Jeremiah Kamanzi could only flick it on towards his own goal and Jack Bowen, who put in a real shift in attack, looped a header over the stranded Jessup. Playing into the wind in the second half, Diamonds knew they would be up against it. But they produced an excellent defensive effort to ensure chances for the visitors were few and far between. Collard was there to tidy up after Marsden beat Heath to the punch after a long ball up the field and the closest the visitors came was when Liam Dolman’s header back towards his goalkeeper drifted just wide after being caught by the wind. But Diamonds had few other close calls as Collard and Dolman marshalled the defence and headed and kicked everything in sight while Westbrook and Farrell provided the shield in front of the back four. At the other end, Peaks’ team didn’t really threaten themselves but in the end, they didn’t need more goals. After back-to-back defeats, some may have thought Diamonds’ race might have been run. Diamonds: Heath; Hicks, Collard, Dolman, Brown; Westbrook, Farrell; Johnson, Diamond (sub Lorraine, 67 mins, sub Curtis, 88 mins), Rogers; Bowen. Subs not used: Acquaye, Ashton. Needham Market: Jessup; Dye (sub N Ingram, 84 mins), Morphew, Baker, Sturgess; Squire; L Ingram (sub Pelling, 41 mins), Kamanzi, Heath, Marsden; Griffiths. Subs not used: Abrahams, Cook. Goals: Griffiths (19 mins, 0-1), Rogers (22 mins 1-1), Bowen (42 mins, 2-1). Bookings: Sturgess, Bowen (both fouls), Marsden (deliberate handball). Northants Telegraph man-of-the-match: Sam Johnson - the winger epitomised the hard-work ethic of this Diamonds side. On a day when free-flowing football was never going to be on the agenda, it was a case of players having to roll their sleeves up. Johnson worked his socks off on the right-hand side and was a constant threat. There were a couple of eye-catching surging runs that created opportunities and, when he had to particularly in the second half, he mucked in and helped do the dirty work to help get his team over the line. This is an example of a player who is getting better as time goes on.